Welcome to "Black Coffee Review", a partner Weblog to our HubPages article with the same name. This Weblog is about coffee without the additives like sugar, cream, mocha, etc...! We like our coffee in its regular not unleaded form. Straight black and piping hot keeps us happy. Our intent is to try coffees offered by restaurants, fast food chains, and specialty coffee houses and post our thoughts about them. Another offering from the Independence Coffee Company. 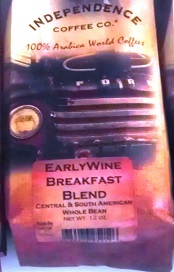 This one is their Early Wine Breakfast Blend. Tasty coffee; this one gets a Good Cup of Coffee Rating! Free Cup of Java Cafe Coffee...! Thanks for stopping by and checking out our Weblog. We like our coffee in its regular not unleaded form. Straight black and piping hot keeps us happy. Our intent is to try coffees offered by restaurants, fast food chains, and specialty coffee houses and post our thoughts about them. That said, we want to invite others to join us on our quest to taste different black coffees and rate them using a simple scale: "Good", "It'll Do", and "Bad". A "Good" cup of coffee tastes freshly brewed and has no bitter aftertaste. "It'll Do" satisfies the coffee urge but just does not make the grade of a "Good" cup of coffee. And, a "Bad" cup of coffee is stale with an aftertaste that requires another beverage to wash it away.